We all see the younger generation operate their computers effortlessly, and we can’t figure out how they do it so quickly and efficiently. The truth of the matter is, that a lot of their speed is thanks to better use of their mouse. Your mouse can do more than just point-and-click, and this guide will teach you how to maximize your use of it. Better mouse control will improve your efficiency and self-confidence in your computer skills. The left mouse button is the one we mainly use, be if for selecting, marking or just clicking away. Here are a few other things you can do with it. You can quickly highlight a segment of text by pressing and holding the Shift key on the keyboard. Then, click once where you would the selection to start, and once more where you’d it to end. To quickly highlight a specific word, simply double-click on it. To do it for an entire paragraph, triple-click it. A different way of highlighting text is by pressing and holding the Alt key on your keyboard, then click and hold the left mouse button, and drag the mouse cursor in the direction you’d to highlight. This will form a (usually) gray rectangle that will only highlight the text inside it. If you’re browsing a web page you , and then see a link to a page you would to check-out later you can do it by opening the link in a new browser tab. Press and hold the Ctrl key on the keyboard and then left-click on the link. It will now open in a separate tab in the browser, and you can continue with your browsing. By double-clicking on the top bar of (almost) any window, you will cause it to maximize and fit the entire screen. Doing it in a maximized window will revert it to its smaller size. 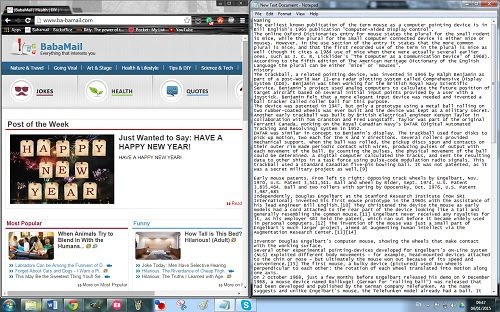 If you’re using Windows 7 or above, you can easily split the screen between two windows to increase your efficiency. To do that, click and hold the top bar of one window, and then drag it to one edge of the screen and let go of the left mouse button. Then do the same with the other window, but drag it to the opposite side of the screen. 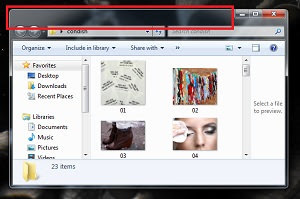 You can transfer a file from one folder to another, or highlighted text from one spot in a document to another. Left-click and hold the file or highlighted text, and then drag it to the desired location and release. The right mouse button is mainly used to open up action-menus. By holding the cursor over a file or highlighted text and pressing the right mouse button, you’ll see a new menu pops out with various options relevant to the highlighted selection. 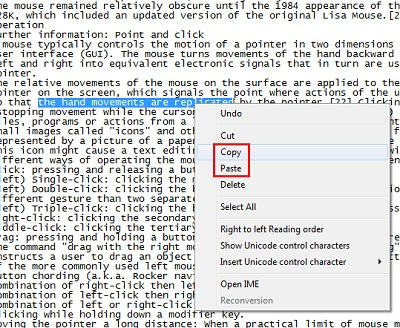 To easily copy a file or a highlighted bit of text, right-click on it and select “Copy” (to duplicate the selection) or alternatively, choose “Cut” to remove the highlighted selection before placing it in another spot. Once you’re done, move the mouse to the place you wish to enter the selection you copied or cut, and right click again, then select “Paste”. Another way of moving a file or highlighted text similarly to the “Cut” option is to click and hold the right button over the text/file and dragging it to that location. 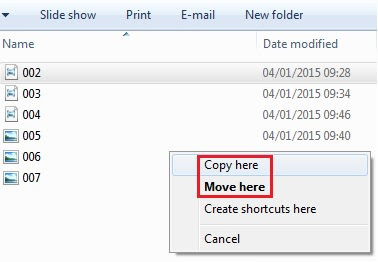 Once you let go of the right mouse button, you’ll have the option to copy it to that spot or move it there completely. On most modern mice, you’ll find a small “wheel” which also serves as a third button, as well as letting you scroll through pages. This button has several functions that will make your life easier as well. The wheel lets you scroll up and down on a page, but if you press and hold the Ctrl key on the keyboard while scrolling, you’ll increase or decrease the size of the text and images on the web page. If you click on a link with the mouse wheel, it’ll open it in a new browser tab. To close an open tab, click on it with the mouse wheel. If you click the wheel in the middle of the page, the cursor will change to something similar to this - . 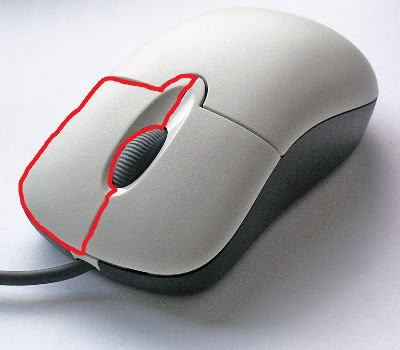 Wherever you move your mouse while that icon appears, your screen will scroll accordingly. The further away you move the cursor from the original spot, the faster the scrolling will be, so it’s recommended that you move it slowly. This final trick only works in the Internet Explorer andFirefox browsers – By pressing and holding the Shift key on your keyboard and moving the mouse wheel down, you will move back or forward on web pages you’ve visited (similar to the “Back” button in the browser).